A while back I heard from my old boss, Judy, from the quilt shop I managed in Florida. She was going to be in town visiting her family and wondered if we might be able to catch up over Thanksgiving. So, between my nephew's wrestling meet and the gingerbread house party, we did just that. But what to do? Well, as I drove to the meet, I noticed a quilt shop, and, wouldn't you know, it turns out it was just down the street from her son's house. So there we were, wandering around someone else's shop. It was a little strange--so often, when I'm in a quilt shop, I look at fabrics and think "That's so Judy" or "Beth would love that." Beth and Judy were the owners of the shop. When the fabric reps would come to the store, it was always a hoot picking out fabrics with them. And I could almost predict which ones each of them would be drawn to. They had similar tastes, but there were subtle differences in their choices. So it was fun to look around someone else's shop and point to a fabric and say "There's one, Judy" and know that she'd say "oh yes!" But we spent a lot of time chatting as we wandered around the store so it was tough for me to focus on shopping. 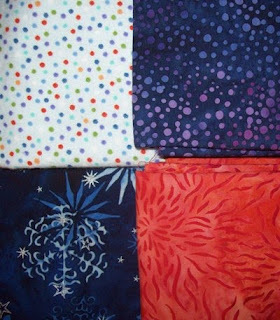 I did find a few fat quarters--three batiks and a flannel (light blue with polka dots, though you might not be able to tell it's light blue from the photo). More to come from my "I really needed a creative fix" shopping trip the Sunday after Thanksgiving. I know, I thought there was a moratorium on fabric buying until I made something, but sometimes that just doesn't work out.